many of which I still remember. The session was conducted by a Catholic Institution in Sydney, and seemed to me at the time (20+ years ago) to be entirely focused on helping individuals understand themselves and others better – the only religious content was what was relevant to the Enneagram model. What I didn’t realise until I began researching the article for this website, was that the roots of Enneagram can be perceived as somewhat controversial. Enneagram has still been included, because as a model for understanding temperament, it is quite unlike the other models discussed (and many others besides). It has nine divisions, rather than the usual base of four, and addresses a number of additional factors in quite a unique manner. For home educators, I consider the opportunity to investigate drives, fears, passions, etc., extremely relevant to how we interact with our children as students. I trust you to use your own discernment as you investigate in this area. While much of Enneagram’s development may be considered perhaps less ‘academic’ than some other temperament models, it has certainly found its way into mainstream use, and provides another interesting tool for those who relate to it. From Greece and Asia Minor, these ideas moved south through Syria and Egypt, where they were further developed. Thus the philosophy behind the Enneagram contains components from mystical Judaism, Christianity, Islam, Taoism, Buddhism, and ancient Greek philosophy. Gerdjieff taught about the Enneagram symbol, using movement and dance, music and story-telling, employing Sufi traditions in his communications. He instructed advanced students in their ‘chief feature’, the lynch-pin of the individual’s ego structure, or the basic characteristic which defined them. Gurdjieff did not teach a system of types associated with the symbol, and he never taught anything about a system of understanding character related to the Enneagram symbol. Ichazo saw the Enneagram as a way of examining specifics about the structure of the human soul and particularly about the ways in which actual soul qualities of Essence become distorted, or contracted into states of ego. While Ichazo taught a system of 108 Enneagrams, just four are focused on in current interpretations: Enneagrams of Passions, Virtues, Fixations and Holy Ideas. Holy Ideas and Virtues are considered Higher Essence Qualities, while Fixations and Passions are considered Ego Distortions. Loss in the areas of Higher Essence is what produces distortion in the lower, Ego areas. Exploring the definitions can seem quite complicated, and the outlines provided below really are very minimalistic. There is a lot more information available for you to pursue, if you choose. Do keep in mind, though, that not everything in the description of your basic type will apply to you all the time because you fluctuate constantly among the healthy, average, and unhealthy traits that make up your personality type. 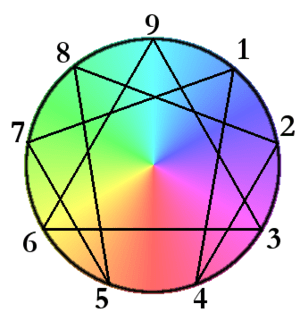 Every person is a unique mixture of their basic type, and usually one of the two types adjacent to it on the circumference of the Enneagram. The adjoining type you have tendencies towards is called your wing. There is an internal structure within each personality type; a continuum of behaviors, attitudes, defenses, and motivations formed by the nine Levels of Development which makes up the personality type itself. These are readily observable on the the Enneagram, as being the lines stretching out either side of the base type position on the outer circle of the Enneagram. Security/Integration point: 4 – Helpful Twos may become emotionally strong, caring, and authentic, like healthy Fours. Security/Integration point: 6 – Threes who recognise that being that success isn’t everything may become comfortable being committed to others and exploring their emotions, more like healthy Sixes. Stress/Disintegration point: 2 – Fours who fall apart can easily become dissatisfied like unhealthy Twos. Security/Integration point: 1 – Fours who become self-actualised came are more idealistic and progressive, like healthy Ones. Security/Integration point: 9 – Sixes who are positive may become more peaceful open and receptive, like healthy Nines. Stress/Disintegration point: 1 – Sevens, when forced to stand still, may become irritable and impatient, like unhealthy Ones. Security/Integration point: 5 – Sevens who are confident and experienced may bring a sense of calm to hectic situations like healthy Fives. Basic Desire: to determine their own life’s course, to protect themselves. human being unless he loves him. The Enneagram Institute: History and Origins, The Traditional Enneagram. Ichazo has called the Enneagram the “Ninth Seal of Pythagoras,” see Goldberg, 1993.